I thought it was worth it to mention that today marks the one-month anniversary of Theater Hopper. It may not seem like much of a milestone, but I’m partial to such occasions. With only 12 strips under my belt, I consider it a freakin’ phenomenon that the site has accumulated over 1,700 unique hits and nearly 4,400 page views. This may seem like small potatoes to some people, but it means a lot to me. I wouldn’t have gotten this far without the help of other cartoonists in the community. There are too many names to mention, but if you head over to the links page, those are the strips you should be visiting on a daily basis. Thanks also to the readers who visit the site and keep coming back. Hopefully I will be able to provide the kind of content you like and look forward to reading. That’s probably enough gushing for now, but I had to let it be known. I’m having too much fun doing this not to say thanks every once in a while. Mar 18, 2004 MORE ANNIVERSARIES! Since I don’t have much in terms of content to deliver to you guys today, I wanted to take a moment to draw your attention to my good friend Beefy. Beefy is a prominent member of the Theater Hopper online community affectionately referred to as the THorum. Beefy also has quite a talent for words set to music. Otherwise known as "rapping" to all the kids. I hear it’s quite popular. Beefy is a musician at the forefront of the emerging nerd-core scene. Chances are if you hang out on the internet with any regularity, love Star Wars and comic books, his new EP "Nerd" will be right up your alley. Maybe you’re the type of person who appreciates "phat" rhymes and "tight" beats. Well, in that case, Beefy’s EP will be right up your alley, too. Support my good friend Beefy. He’s got some great songs for you to listen to and they don’t cost a lot of dough. I know he would appreciate your support so he can continue to produce his original sound and bring it to the world. Feb 20, 2009 WHUTCHU LISTENIN’ TO? I just wanted to send a shout-out to the people who have been helping me to promote the book today. As you can imagine, it’s been nerve-wracking trying to guess what the resonse will be. These stand up guys have really done a great job helping to spread the word. First, thanks to Tim from Ctrl+Alt+Del. The number of hits he’s been sending my way are STAGGERING. I think Tim linked to me once a long time ago after I did a guest strip for him. I thought those numbers were impressive. Let’s just say he’s doing pretty well these days. You never really have a concept of how popular your contemporaries are until you’re linked by them. At any rate, if you’re new to the site, welcome. I think you’ll find a lot of great stuff here if you’re into movies. Be sure to play around with the archive search function. Type in whatever you can think of. You’ll be surprised with some of the results it returns. Oh, and if you have some extra money to throw around, don’t forget to pre-order a book! I also want give thanks to Joe Dunn for a very nice write-up over at Joe Loves Crappy Movies. It means a lot. Also Web Comics in Print gave us a plug as well as the consistently Bigger Than Cheeses – which has been on quite the roll lately, I must say! Anyway, thanks to you all! Some other news: I’ve installed a couple of book-related graphics between the comic and the blog. One of them is a reminder for you to take advantage of our street team offer. The other is a gauge that roughly shows you how far we need to go on the pre-order front before we have the funds needed to send the whole thing off to the printer. Today was a good day. We’re a little less than one-tenth of the way to our goal. That’s very respectable – but I’d like to make sure we keep going strong! So if you’re thinking about pre-ordering, don’t wait! We need your support! Be sure to tell all your friends as well. Spread the news around the internet. Tell people about the book in the forum communities you visit or on your LiveJournal friends pages. On average, there about 6,000 of you who check the site daily. If every one of you told a friend about Theater Hopper and what we’re doing with the book, that’s excellent word of mouth! You CAN make a difference! Thanks again to everyone for their support! Launching this initiative has really shown me how tight the community is and how many great friends I’ve made doing this. I consider myself exceptionally lucky. First, I wanted to say thanks to everyone who has sent e-mails or left comments in support of my computer problems. I’m getting lots of great feedback. Truthfully, though, I’m having a little trouble sorting out what route to take and I thought it might be helpful if I offer you guys a little more information. Right now, my desktop has two hard drives. One that is 120GB that houses the operating software and all the other software like Photoshop, Dreamweaver and the like. The second internal hard drive is 20GB, came from my last computer, was wiped clean and now only contains Theater Hopper information. I have a third hard drive that is external and houses all of my MP3s, photos and video. If I ever get this sorted out, I’m going to move all that Theater Hopper stuff over there, too. I’m starting to wonder if my OS hard drive is starting to crap out on me. My machine is about 3 or 4 years old and I noticed it was making some strained whirring sounds in the last month or so. I’ve had one person advise that I replace the hard drive with Windows XP already installed and then bring over all the old software. This might be a more costly solution, but might be more viable long term if it is the hard drive physically failing. Anyway, that’s a little more information to go on. I still haven’t decided what I’m going to do, but maybe some of you who have left suggestions can take this information to help me devise a more specific course of action. May 1, 2006 I FORGOT – I NEED GUEST STRIPS! The mounting sense of pressure I blogged about with Wednesday’s comic became very pronounced while I was writing today’s comic. It’s been interesting tracking these last few comics about New Moon. You guys are very into it. You’re posting lots of comments and submitting ranking votes in record numbers. All good things! The ranking thing I really blowing my mind. As if this writing, 101 of you ranked Monday’s comic and 92 of you ranked Wednesday’s comic. When you consider the average is about 20 people, it feels really good when a comic generates over 5 times that level of interaction. So keep it going! Keep rating the comics! Keeps submitting your feedback in the comments section. I love to read about what you guys think, so let’s see more of that! To that end… I feel a little embarrassed that I ended the arc this week with a very lame and obvious pun. But I at least hope you find it endearing. It’s nice to put a bow on these things sooner rather than later before they get drawn out. I’m wondering if anyone here saw the midnight screening of New Moon last night and if so, what did you think? Consensus among critics is trending downward. As of this writing, the film has been given a 29% rotten rating at Rotten Tomatoes. When you consider the original Twilight averaged about 49% positive, that’s a red flag. Obviously Twilight has a contingent of die hard fans. But now with New Moon, nearly 25% of the people who were on board with the first movie have jumped ship. Why? I’ve read that star Robert Pattinson isn’t in the movie much – really only at the beginning and at the end. Co-star Kristen Stewart ends up carrying most of the movie. Of course, this shouldn’t be a surprise to fans of the books. And certainly the movie has hit upon a piece of choice casting by adding Taylor Lautner as Jacob. So there must be something that’s keeping it from connecting with the critics. Of course, this is entirely moot. The film will do just fine at the box office this weekend. Entertainment Weekly is already predicting an $80 to $100 million haul. Obviously they’ll film the next two books as well. It’s just food for thought. I’m all about realistic expectations, people! Time to leave your thoughts in the comments below! Are you one of the Twi-hards who saw New Moon last night? Let us know what you thought! I didn’t go crazy with this week’s Top Web Comics incentive sketch. Just a simple profile shot of Charlie, since she seems to be on Jimmy’s mind. 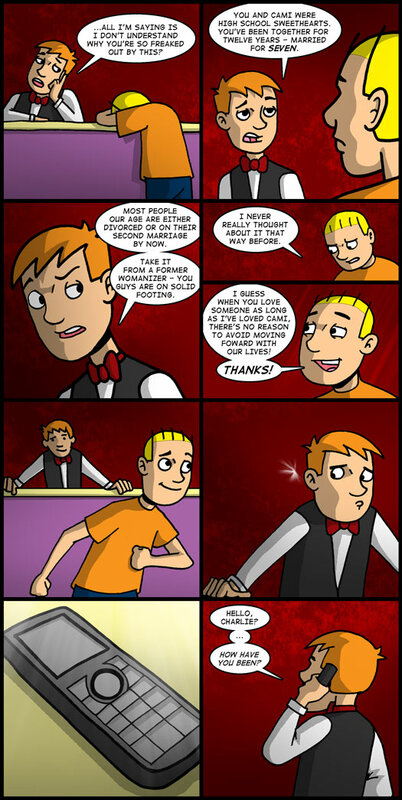 If you vote for Theater Hopper at Top Web Comics, you’ll get to see the whole thing! Check it out! My apologies for the lateness of this week’s comic. I knew when I was putting it together that I wanted it to be double-sized to take advantage of the pacing. I just didn’t estimate how long that would actually take. For your reference, I’ve included a couple of links to some of the issues this comic brought up. Yes, Jimmy was a former womanizer. He also once had a relationship with Charlie and they almost got married! It might be easier if you check out that story line from the beginning if you haven’t read it before. It’s one of the arcs that I’m probably most proud of. Kind of funny that it’s pretty much the 3 year anniversary of that story and how it’s finally coming full-circle. I mentioned last week that since this is the last hurrah, it was my ambition to tie up some of the loose ends with several of the characters. Jimmy – witnessing Tom’s potential evolution into a family man – is deciding maybe it’s time to stop torturing himself and pick up with Charlie where they left off. We’ll get to see that play out before it’s all over. That’s all I’ve got for right now. I just want to remind everyone to check out the Theater Hopper store and help me unload some of my inventory. I’ve got a pretty aggressive sale going on right now. Buy any two books, get the third one free. Buy any two shirts, you’ll also get the third one free. There have been several people to take me up on the offer so far – including people who have ordered the Artist Edition’s of the books. If you’d like me to personalize your book with a sketch, it’s a great opportunity to get something unique. By the time August rolls around, I don’t know if I’ll be doing sketches in books anymore. Get yours now! Thanks again for your support and your patience. I’ll see you soon!